LOS ANGELES -- The idea of crossing the 101 Freeway on foot is just as wild as the mountain lion that did it and lived. 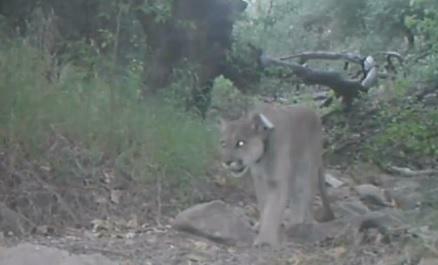 "The fact that he was able to cross the 101 is really amazing for sure and he's in a small group of documented mountain lions that have done so," Ranger Karen Kuykendall said. CBS Los Angeles reports P-55 is the fourth-known mountain lion to have crossed the 101 and lived to tell the tale through his GPS tracking collar, which sends six to eight locations per day. P-55's collar showed that he skipped town the day after he was caught on critter cam almost falling into a spa in Newbury Park last month. "P-55 was on the western end of the mountains and crossed the 23 and 118 and is now hanging around in the Santa Susana Mountains," Kuykendall said. The journey up north is a big deal for P-55, who is less than 2 years old. "Very few males actually survive past the age of 2 because mountain lions are so territorial, especially males, and they won't tolerate one another," Kuykendall said. Rangers are hoping P-55 finds love along the way and keeps the population growing. Hollywood fat cat P-22, a famous bachelor in Griffith Park, has little chance of doing so. "It was great that P-22 made it to Griffith Park but he has nobody to mate with," Kuykendall said. P-22 lives in a very small area and needs space for breeding. There is talk of a bridge being built over the freeway at Liberty Canyon in Calabasas so lions can cross safely to continue breeding.